A very dirty looking steam locomotive at High Shields, Engine No 65666. Taken in 28th June 1957. Sent in by © Allan Edwards. 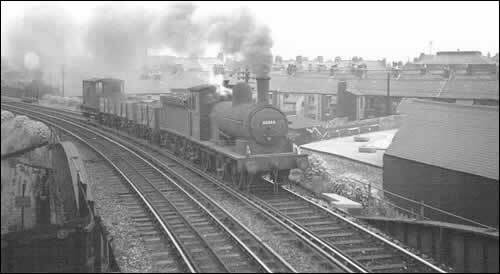 0-6-0 J25 on light freight c1957. Wordsell design for North Eastern fits between J24 and J26 in size, 4'7" wheels 4'3" boiler, purely freight engine (no continuous brakes). Series started with 65645 built 1898 and finished with 65728 built 1902. Ten lasted until 1961 but were all gone by 1962.